And I was about the be well fed too! The Saba hotel's breakfast was fresh and delicious. The scrambled eggs were creamy, cooked to perfection (they get most of their eggs from their chickens on site), and the country bread was heavenly. Sam had eggs and ham (ha ha! Were they green Sam-I-am?) with a side of their homemade yogurt, fruit and cereal. We were both delightfully stuffed! 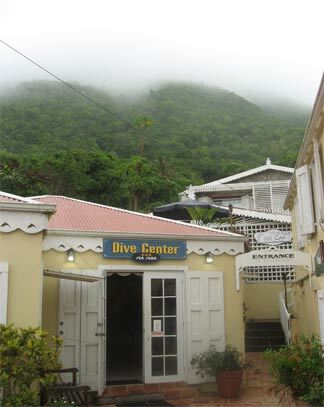 As I mentioned before, Sam's Dad used to run a dive shop and teach diving in Anguilla. As a result, he knows a lot of divers from other Caribbean islands. 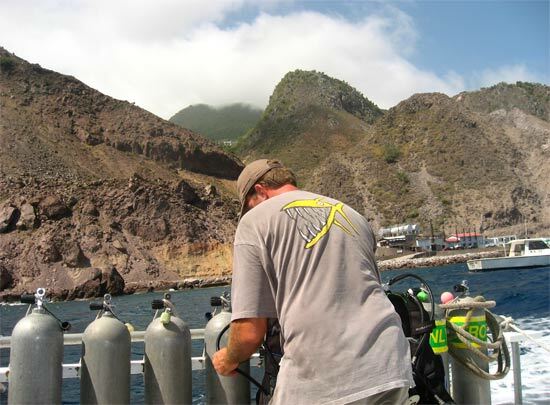 His friends John and Lynn have been managing Saba's top diving company, "Sea Saba", for over fifteen years. I never met John, but Lynn is a terrific woman who gave me and Sam a lot of great advice on our Saba island trip. On top of all of the pointers on where to eat and how to get around, she also set up a dive for Sam. I still haven't gotten over my fear of deep waters (I know, I know! 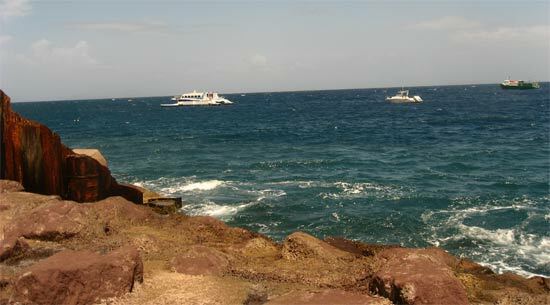 ), so I wouldn't be diving, but I was excited to see a different part of Saba. 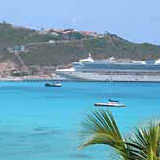 We would be departing from "Fort Bay", on the opposite end of the island. 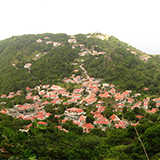 The views were spectacular as we gradually descended to the Bottom, Saba's capital. The climate changed significantly. The sun was hotter, the air was drier. It felt very similar to Anguilla's capital, the Valley. The foliage changed too. There were less philodendrons and more flamboyant trees. We passed the medical school, the police station and made our way to Saba's steepest, curviest road yet... the one that would take us to Fort Bay. 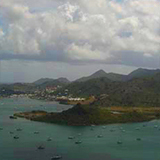 Fort Bay is an industrial harbor, with one restaurant, one bar, the island's limited power plant, and various machines working away. Bring your sunglasses, chunks of dust will get in your eyes! The water here is dark and scary (I even saw fins protruding from the water - the dive master said they were only Tarpin). I was also distracted by the sign "Danger Falling Rocks". I believed them, the nets at the bottom of the mountain were full of hunks of cliff that broke right off! 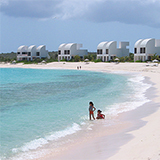 Fort Bay is a far cry from Sandy Ground in Anguilla. And Then... There Was The Dive Boat! 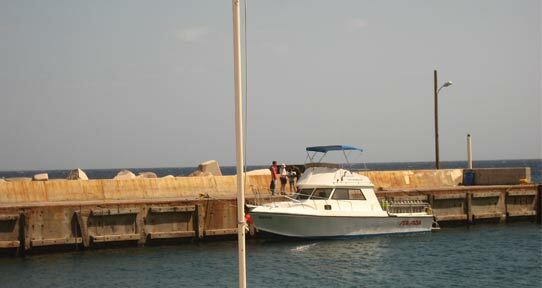 Sea Saba has the best dive boats on the island. They have two 40' boats that are fitted out for a day on the water, with plenty of seating space, gear space, a fresh water shower, and coolers. Troy and Kelly (Sea Saba's diving instructors) took us out to one of the best dives around Saba, "Tent Reef". Can you believe that it was just outside of the harbor? While they dove, Troy and I stayed on the boat, chatting and enjoying the afternoon sun. He used to work at P&G in Miami in marketing. When he came close to getting a promotion and moving to Ohio, he gave it all up. Now, he travels through the Caribbean, giving tours of different islands and teaching diving... What a great story! It was a shallow dive, so they were back up in no time. The only diving Sam does in Anguilla is wreck diving, so he was happy to see such a healthy reef on the Saba dive. 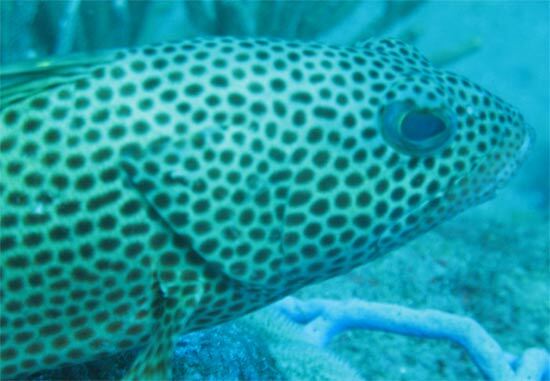 His favorite part of the Saba dive? Traveling through underwater tunnels! That seemed spooky. He will return to dive in Saba again, this time on their famous dives: pinnacle dives, under water volcanoes. They tend to get pretty deep and many spot sharks on the dive (they are rare and otherwise hard to find). It sounds like an exciting underwater adventure! Maybe next time. Back on shore, Sam thanked Kelly and Troy for the dive, and I thanked them for letting me tag along. There were only a couple of hours left in the afternoon, so we hung around Fort Bay a little while longer and then caught a taxi home. This time Sam and I were riding in the front. And this time, I saw that all that separated our speeding van from soaring off cliffside was a two foot high stone wall. My stomach dropped. I had to ask our driver about car accidents. But nope, not a horrific accident he could remember! I breathed a sigh of relief. The taxi ride turned out to be a success. Not only did we get a cheap tour of the island, it was a thrilling one too! Sitting up front really makes a difference. Your driver does, too. Our taxi driver was a real character... He was stressed from too much working, too much driving. I remember him saying, "I need to take some time off and go to St. Maarten." 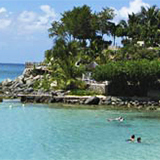 St. Maarten? From Saba? To relax? Well, wherever your work is not right? Our tummies were grumbling again. Breakfast had been quite some time ago... Now, it was Brigadoon for dinner. Ask anyone on the island, and they will all tell you the same thing. 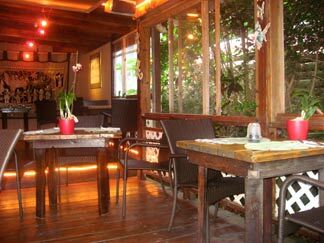 Brigadoon and Rainforest Restaurant are the top two Saba restaurants for dinner! Brigadoon has a charming setting and a friendly atmosphere. We were twenty minutes early for our reservation (that trail was getting easier and easier! ), and although the restaurant wasn't opened yet, we were not turned away. One of the owners, Michael, greeted us and served as a drink as we relaxed and worked on building an appetite! He came back to chat a short while after, too. The hospitality was certainly warm and welcoming. ... And then we met Trisha, the life of the restaurant! Michael and Trisha own the restaurant. She is from Texas and he is from Lebanon. They met in San Antonio years ago. The rest is history! Michael cooks and Trisha entertains. Boy, do I mean entertain. She's a firecracker, spinning joke after joke, and always making sure you are well taken care of. Their menu made my mouth water! I miss Montreal for two things: bagels and Lebanese food. There is a huge Lebanese community in Montreal. I still crave falafels and shawarma. You could imagine how I felt when I saw a shawarma wrap and falafels on their menu. Much to my dismay the shawarma wrap is only served on Fridays and you have to order in advance. They have "Sushi Saturdays" too, which works the same way. Thursday is prime rib. Oh well, I was still worked up for the falafels! Trisha took our order and brought us some hot rolls, straight from the oven. With plenty of time in between, our appetizers were up next. Sam ordered a New England seafood chowder. I was still going with the falafel and homemade hummus plate. 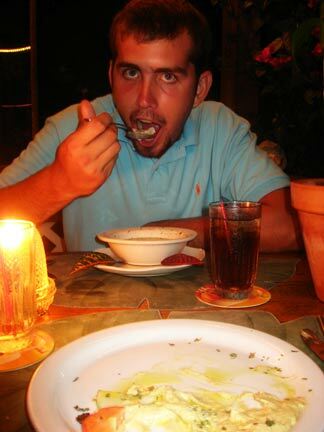 Sam knows New England seafood chowder, spending a lot of time in the North East. He declared his soup the best he's ever had. I snuck a few bites, and agreed! It was a New England chowder, but less heavy. Perfect! I felt the same way about the falafels. They were better than any I had in Montreal. They were not greasy and soggy, but light and crisp. The hummus was smoother, too. As we waited for our main course, we talked sadly about the trip. At the time, we believed that this meal may be our last dinner in Saba. Our flight was at 4:00 pm the next day. 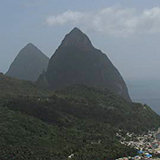 Would we have enough time to hike the highest point in Saba, Mt. Scenery? And, would we be able to do a little more exploring? 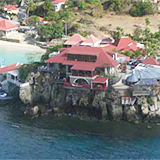 Sigh, we had fallen in love with Saba! 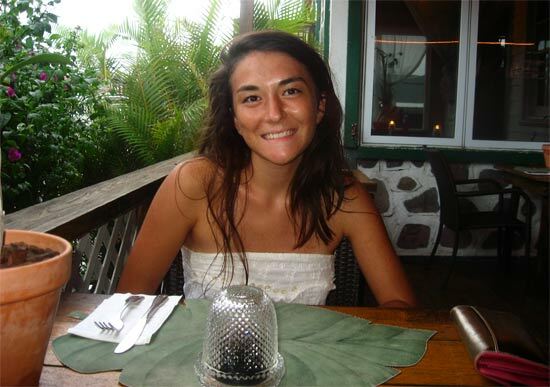 Before we got too down, Trisha returned with two plates of almond-crusted grouper. The fish was fresh, not flakey, not oily, baked just right, with an exotic, sweet sauce. I got halfway through and had to put the fork down, much to my dismay. My tastebuds wanted me to keep going, but my stomach was on the brink of exploding. We finished our drinks and enjoyed the comfortable ambiance. Getting sleepy, we asked Trisha for our check and if she could order us a cab. She brought the check, but refused to call a taxi, "Don't worry about it, Michael will drive you." Sure enough, he was waiting outside in his truck. He drove us all the way back up the hill to Ecolodge. On the way, we talked about Saba, the restaurant, and, with most interest, about Lebanon, a country I am dying to visit. Before we could finish our conversation, we were already there. We thanked him most graciously for cooking one of the best meals either of us have ever had, and for bringing us home, too! Michael and Trisha are the most warm-hearted people, with a terrific restaurant. 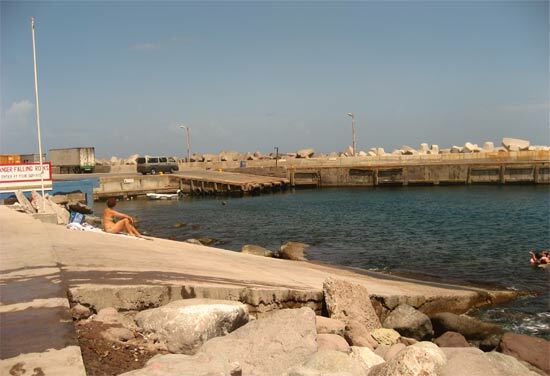 Do not miss Brigadoon on a Saba island vacation! 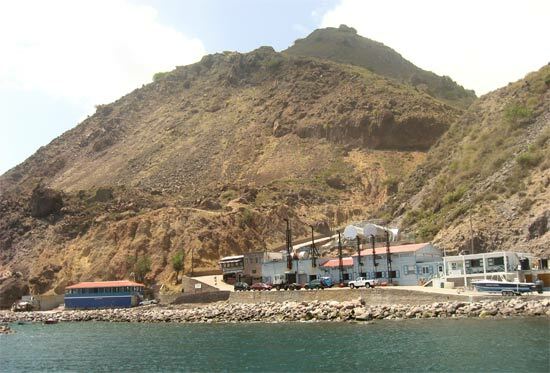 Click here to read about Day 3 of our Saba island vacation.